DEL MAR — Gun laws are a hot topic and California possesses some of the strictest regulations in the country when it comes to guns. 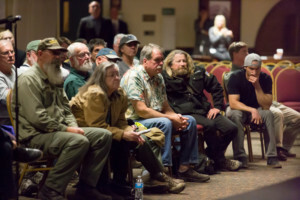 On March 17, the San Diego County Gun Owners Political Action Committee held its second annual gun law convention at the Del Mar Fairgrounds. Executive Director Michael Schwartz organized three discussions and a live demonstration to inform attendees of the state’s current and soon-to-be laws. 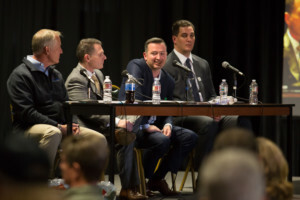 The first panel featured four attorneys discussing and taking questions about some of the latest laws, many of which they said are contradictory and overreaching. The second panel featured those in the industry working on legislation for gun owners, activism, education and complying with the law. Schwartz and Craig Deluz of the Firearms Policy Coalition described their work on educating local and state lawmakers and working toward sensible legislation. They both said their groups are bipartisan and focus only on Second Amendment issues, cautioning the audience of supporting a politician just because of party affiliation. San Diego County Gun Owners has endorsed San Diego County Sheriff candidate Dave Myers, noting his support and action for allowing concealed carry permits. Deluz said his group has worked with Democrats and Republicans in Sacramento to fight against overreaching legislation. In addition, he said the group’s social media presence is a source of news and information for gun owners in California and several other states. On the liberal front, Lara Smith of the Liberal Gun Club was also part of the panel. Although much of her political concerns were different from many in attendance, her love of guns, safety training, education and activism allows liberals afraid to express those same views a safe place. She noted 25 percent of Democrats in the state own a gun, perhaps surprising many in attendance. She also said issues such as self-defense don’t play well with liberal gun owners, therefore other tactics are used to educate and welcome those people into the community. 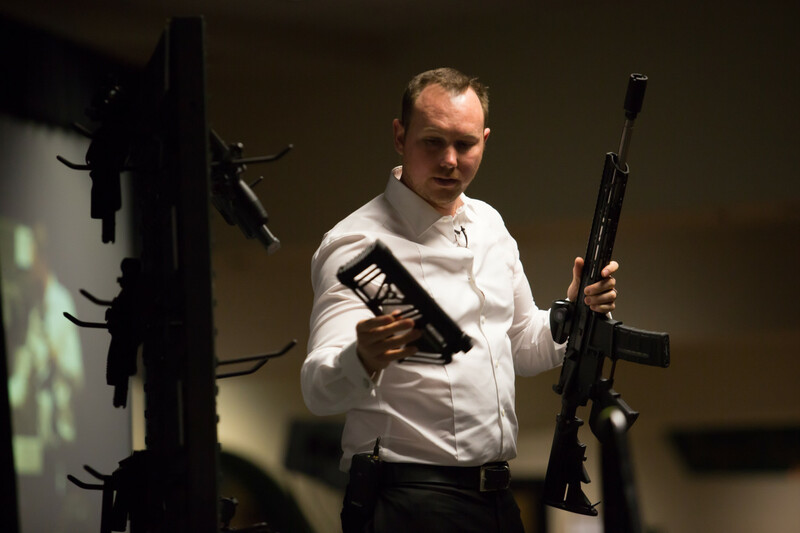 Wes Cross, co-founder of Cross Armory in Carlsbad, gave a demonstration with the AR-15 rifle, showing attendees how his company ensures compliance. 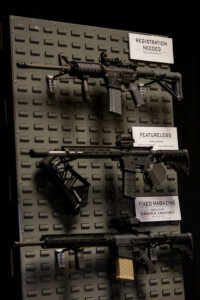 Cross demonstrated the differences between a fixed magazine (where the magazine cannot be removed unless the upper and lower receivers separate), featureless (weapon cannot have a pistol or forward grip and a collapsible stock, among others) and the bullet button (which is classified as an assault rifle, must be registered and where a tool is inserted to release the magazine).